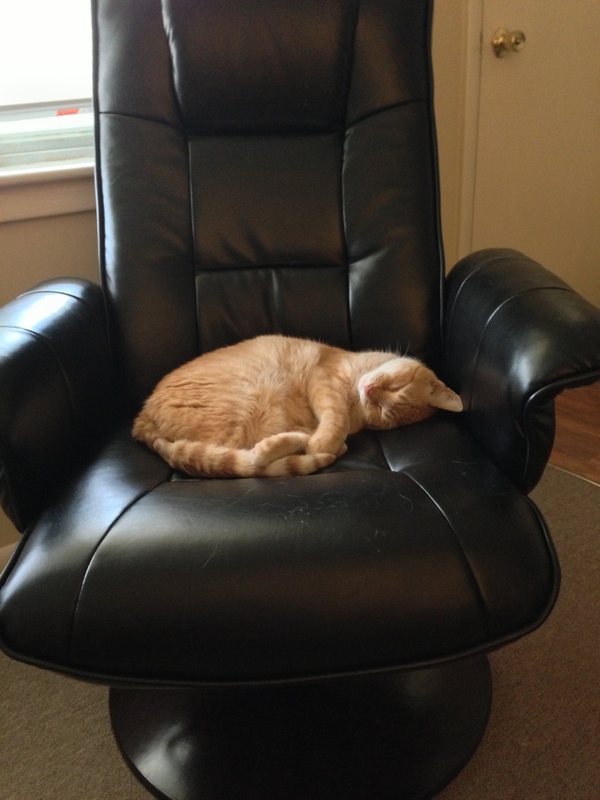 This chair is a great spot for a nap. 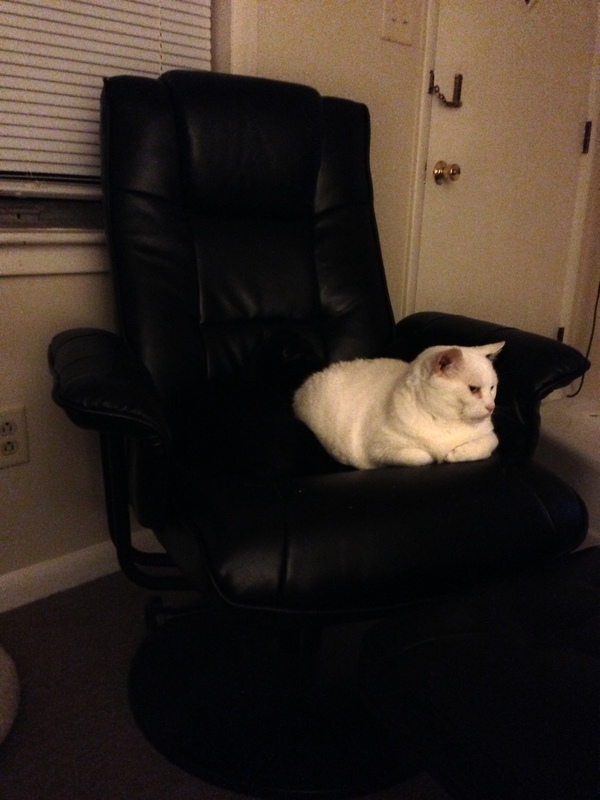 The fake leather chair makes for a comfy napping spot. It’s roomy enough to share with a friend. Uh, we’re trying to nap here! Or maybe just to spend some time alone with your thoughts. Sometimes a cat just needs some time on his own. Is there a favorite place in your home where you like to spend some quiet time? « Wordless Wednesday- Could it Be Cookies? 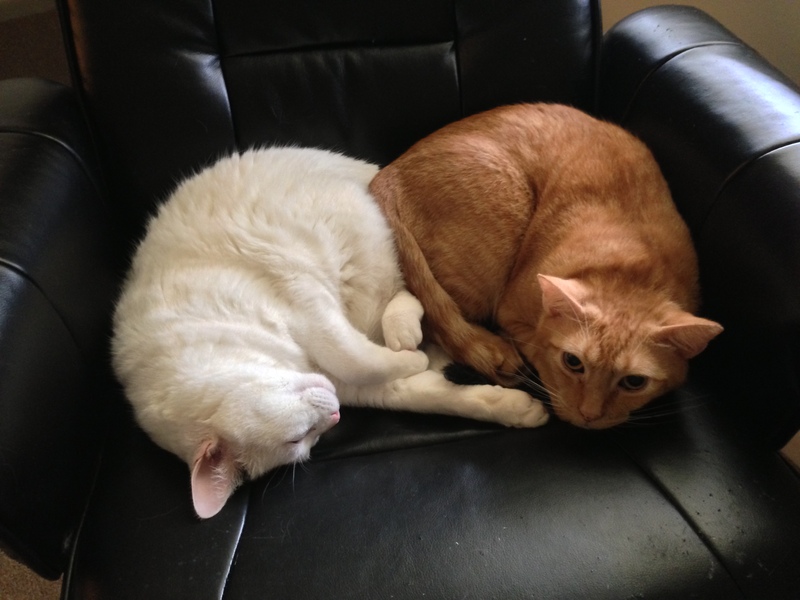 My cats share too sometimes and then one gets mad, a fight ensues and then there is only one cat on the spot. Reblogged this on Cats & All That . Nobody knows how to get comfortable like a cat! I bet they don’t care. BOL! It’s new. Glad you like it! Maya & Pierson are envious. They have to sleep in their dogs beds or on the floor. Although, the floor does have a benefit if it is by my feet because it means an occasional belly rub with my foot. Oh, I love this post! Cute kitties!!!! Awwww. So cute. What a great nap spot. Whee want one! I’m very happy to nap and enjoy my sweet repose whenever and wherever I can, but if it happens to be in a spot where I can curl up with a couple of such beautiful cats, all the better! What a great spot you guys have to share! Boomer and Dottie have their own places they like to nap such as right in the middle of our bed or on the couch in our spots! Sam and Linus want any spot Oregano or I am occupying at the moment. They will sit on us and stare at us until we get up then curl up in the warm spot we leave behind. Our reclining love seat fits two adults and two terriers. The big aussie shep would like to join us, but then the humans and both terriers would have to evacuate. Life can be unfair. Looks pretty good, this chair, I prefer the ground – love the red and light-brown soft carpet in the living-room: silk with wool, a special perfume.